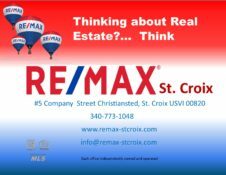 At RE/MAX St. Croix we are committed to providing my clients with professional services based on my experience, knowledge and skills. We have filled this website with tips and resources to help you quickly understand what you need to know — and how we will deliver the services designed to meet your real estate needs. Our agents are experienced, professional and always excited to show off our island’s real estate market, customs and culture We have the reputation for putting you, the client, first. Any time you want information on the market or are ready to buy or sell a property – contact us. There’s no obligation.